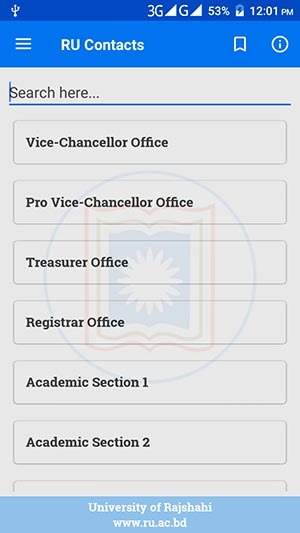 This Android app contains phone numbers and email addresses of RU teachers, officers and other staffs. Anyone can find contacts of a person by searching or by navigating through the listings and can call, text or email him/her directly from this app. 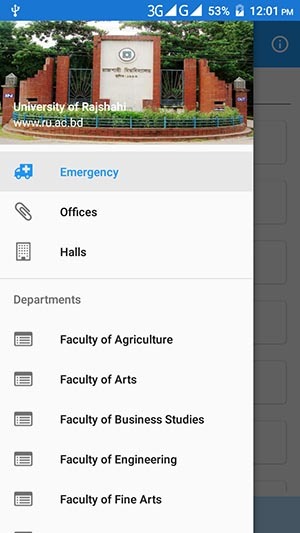 If any new or updated information is available, data inside this app will automatically be updated when the phone is connected to the internet. Get desired information by navigating through different categories. Search contacts by Nane, Designation, Department or by Mobile, Office Phone, Residence Phone. Get real-time notification with contact details when an unknown number (not saved in device’s Phonebook/Contact List, but available in this app) calls you. Mark your frequently contacted contacts as “Favorite” to find them easily. Add contacts to device’s Phonebook/Contact List directly from the app.